This year’s ‘Round the Bridges’ took place on Thursday 28th June in glorious sunshine and temperatures that were more suited to spectating than distance running. That being said over 400 runners turned up on the night to take part in this very popular road race. With the increased popularity of the event Springwell RC took the decision to move the registration centre to the Roe Valley Leisure Centre, which although further away from the race start than the previous centre, provided participants with excellent facilities for changing, showering and ultimately enjoying the excellent post race hospitality. With a slight change to the start to comply with changes in legislation the runners gathered in the grounds of Limavady Recreation Club on the Killane Road in preparation for the start. Last minute entries on the night and reigning champions, Andrew Annett (North Belfast Harriers) and Breege Connolly (City of Derry AC) were immediately installed as pre race favourites and there was no doubt about their talent as they dominated their races to retain their titles. Within the first half mile Andrew and Scott Rankin (Foyle Valley AC) had established a lead from the following pack with a blistering pace but, shortly after the first mile marker, the high temperatures began to have an influence as Scott was unable to keep pace with Andrew who very quickly established a considerable lead. Despite the comfortable lead Andrew did not slacken his pace and came very close to breaking the course record with an excellent time of 51.50. Scott was comfortably second with a time of 54.39 while John Kinsella (Bilboa AC), from Limerick ran a time of 56.55 to complete the podium. In the ladies race former Olympian, Breege showed her talent, leading the event from start to finish, crossing the line in an impressive 58.19 and 7th overall. Ciara Toner (Springwell RC) continued her recent excellent run of form to finish second and 13th overall with 1.02.37, while Paula Worthington (Ballymena Runners) finished third, and 44th overall in 1.08.56. In the team events the Springwell RC quartet of Stephen Joyce, Fergus Irwin, David O’Neill and Jimmy Stewart won the mens race while, in the ladies Leanne Sands, Kate Semple, Lisa Simpson and Ciara Goddard won the race for Acorns AC. Breege, who represented Ireland in the 2016 Olympics in Rio, was not the only former Olympian at the event. Proving the adage that, ‘talent is permanent’ Tommy Hughes (Termoneeny RC), who represented Ireland in the marathon at the 1992 Olympics in Barcelona, ran a time of 1.05.13 to finish 21st and win the M55 age category. Adding to the Hall of Fame for Thursdays race, former WBO Welterweight World Champion, Eamonn Loughran (Ballymena RC) finished 17th in a time of 1.04.20 to win the M45 age category. Springwell RC would like to thank everyone who supported the race, especially our sponsors at the North West Independent Hospital, The Bank of Ireland and Carrowmena Activity Centre, for their hard work at the much appreciated ‘water stations’, the assistance of the manager and staff at the Roe Valley Leisure Centre, and the army of volunteers who give their time and efforts to make this event the success that it is. Springwell RC Results - 11th Stephen Joyce 1.01.42 (1st Mens Team), 13th Ciara Toner 1.02.37 (2nd Lady), 18th Fergus Irwin 1.04.36 PB (1st Mens Team), 19th David O’Neill 1.04.43 (1st Mens Team), 22nd Jason Scott 1.05.15 (Pacer), 32nd James Stewart 1.07.19 (1st Mens Team), 35th David McAfee 1.07.38, 41st Colin Loughery 1.08.29, 43rd Hugh Boyle 1.08.55 (1st M65, 46th Peter Cromie 1.09.04 (Pacer), 48th Maurice Walker 1.09.25, 55th Dave Sexton 1.10.42, 56th Gary Moore 1.10.45, 58th Terry Glenn 1.10.45, 62nd Andy Dowey 1.11.27, 63rd Patrick Gallagher 1.11.27, 67th Alister Jamison 1.12.24, 70th Jeff Young 1.13.00, 75th Ryan Kennedy 1.13.48, 104th Gary Kendall 1.17.00, 105th James McMullan 1.17.04, 106th Warren McIlmoyle 1.17.26, 111th Fergus Thompson 1.18.06, 113th Simon McLean 1.18.37, 124th Timothy Bacon 1.19.35 (Pacer), 125th Davy MacNicol 1.19.35 (Pacer), 126th Meabh Close 1.19.15 (1st F45), 132nd Roy Buchanan 1.19.55, 143rd Catherine Pinkerton 1.20.46, 144th Mervyn Thompson 1.20.59, 145th Stephen McLaughlin 1.21.01, 147th Paul Campbell 1.21.06, 151st Paul Quinn 1.21.33, 156th Kieran Cooke 1.21.59, 163rd Pauline Mullan 1.22.34, 168th Helena Dornan 1.22.56, 172nd Lisa Hegarty 1.23.51, 188th Alistair Kirk 1.24.27, 194th Alan McIlfatrick 1.25.17, 221st Claire Ramsey 1.28.20, 223rd George Brien 1.28.23, 228th Jim O’Hara 1.28.47, 236th Alanna Millar 1.29.11, 250th Andrew Kincaid 1.29.58 (Pacer), 251st Kerrie McIlmoyle 1.29.59 (Pacer), 252nd Lisa Young 1.30.03, 259th Elizabeth Deighan 1.30.45 (1st F55), 271st Mary Brogan 1.32.57, 273rd Louise McDonnell 1.33.24, 274th Andy Wilson 1.33.31, 283rd Janet Patrick 1.34.40 (2nd F55), 287th Liz Dowey 1.35.11, 289th Jim Platt 1.35.00 (1st M70), 292nd Mark Neely 1.35.23, 293rd Eden Whiteside 1.35.27, 317th Nicola Stewart 1.37.42, 321st Betty Anne O’Kane 1.38.07, 329th Bob McLaughlin 1.39.29, 336th Heather McLaughlin 1.40.34, 337th Ally Kelly 1.41.19, 338th Laura Wilson 1.41.30, 350th Fiona Walker 1.42.58, 353rd Karen Robinson 1.43.23, 358th Catherine Byers 1.44.04, 359th Elaine Montgomery 1.44.12, 360th Amanda Scott 1.44.13 PB, 361st Alison Duncan 1.44.14, 364th Ursula Harper 1.45.01, 369th Judith McLaughlin 1.46.20 (3rd F60), 373rd Janet McNicholl 1.47.08, 377th Emer Thompson 1.47.50 PB, 378th Roisin Walker 1.47.57, 379th Esther McIvor 1.48.08, 381st Zara Hunter 1.48.48, 387th Pauline Duke 1.50.13, 403rd Lorraine Abernethy 1.54.04, 417th Aidan Mooney 2.03.47, 419th Kenneth Bacon 2.05.11, 420th Sandra Williamson 2.06.39. To mark the 30th anniversary of their club Larne AC revived the famous Antrim Coast Road Marathon with such a resounding success there are already calls for it to be made an annual fixture. The race, which took the field from Cushendall to Larne, was originally named the Nescafe Coast Road Marathon and was a prestigious event in the 1980’s, attracting athletes such as running legend Ron Hill to Northern Ireland. Saturday’s race saw Ben Morrow (Ballymena Runners) and Karen McLaughlin (Springwell RC) making the headlines as almost two hundred competitors braved the scorching weather to race along the famous Antrim Coast Road. The start of the race saw James McIlroy (Wycombe AC) and Mark Smith (Mallusk Harriers) sharing the lead with Ben before he took charge in the second half of the race. Having firmly established his lead Ben crossed the finish line in an excellent 2.43.55 with Mark holding on for second in a time of 2.50.26. Chris Denton (Springwell RC) showed his excellent form, coming through in a strong finish to take third place in 2.53.25. In the ladies race Karen McLaughlin (Springwell RC) continued her excellent recent form to win the race with another personal best. Karen dominated the race from the start and won in a time of 3.18.01. 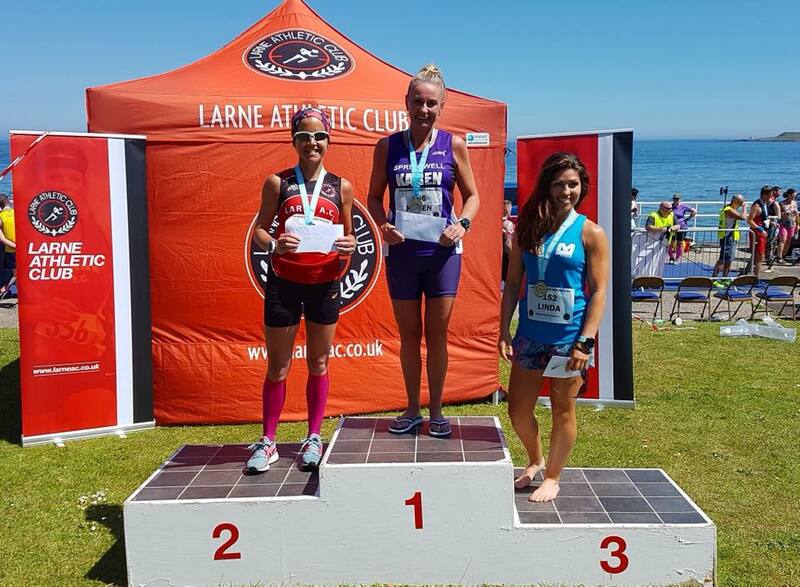 Host club athlete Patricia Blair (Larne AC) was second in 3.20.13 with Linda McDougall (Unattached) completing the podium in 3.28.51. Tuesday's International T&F meeting at the Mary Peters Track was preceded by a number of events for local junior athletes. In the girls primary school 1000 meters Eobha McAllister (Springwell RC) produced another excellent run to win in a time of 3.26.72. Although suffering in the heat club mate Mairi Clements still managed to produce a great run to finish in 3.43.12. In Friday night’s Newell 10k in Coalisland, Luke Dinsmore produced a time of 35.13 to finish 12th in a very competitive field. while in the East Antrim Marathon Series on Saturday John Butcher and Nigel McNeill both finished in a time of 4.08.00. Eobha McAllister and Mairi Clements at the Mary Peters Track.